April « 2012 « How Do You Measure 525600 Minutes? After working twenty nine days straight, I finally had a day off yesterday to recuperate. By recuperate, I mean a day doing laundry and cleaning. Now it’s on to the final month of school: concerts, meetings and award programs. It will most likely take me several months to feel like my self again. Six months of planning and rehearsing resulted in an epic production of Ragtime that I hope will have a lasting impact on the cast and audience that got a chance to see it. When you begin the process, you never quite know how it will turn out. 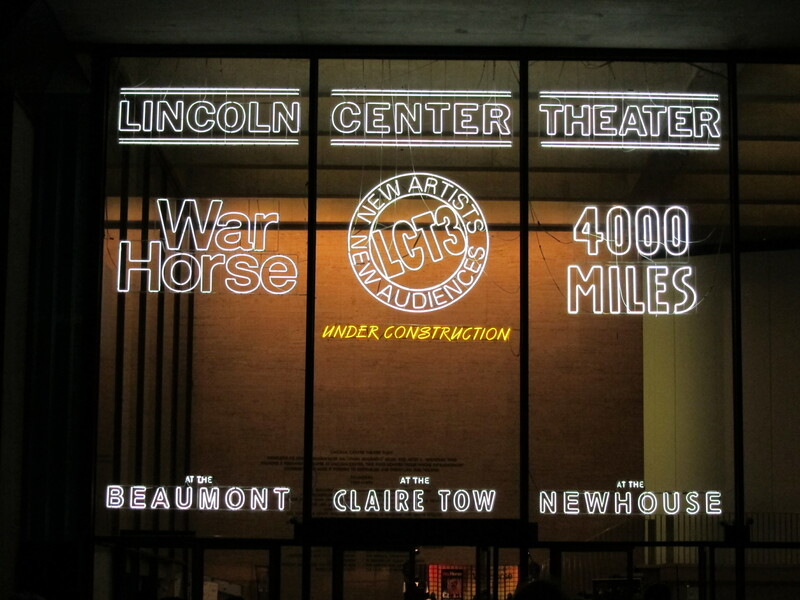 For me, three days before we opened I was a little more than fearful we had missed the mark. 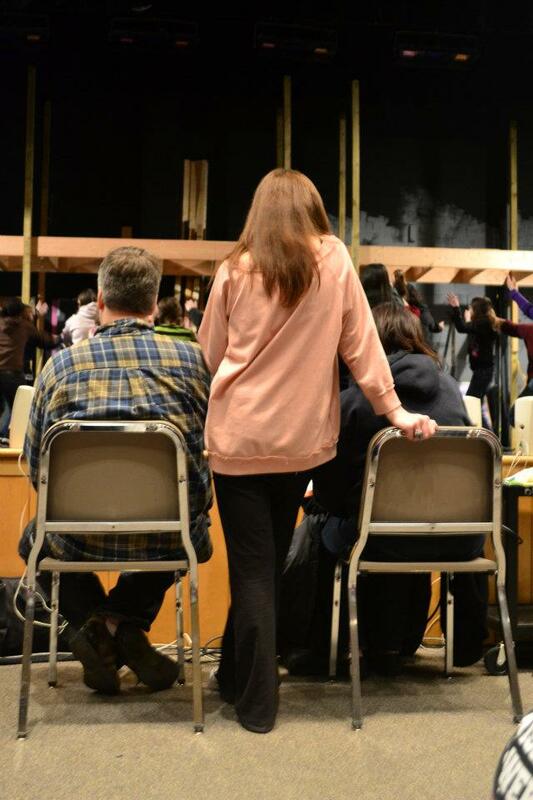 Each day brought us closer and the cast, orchestra and tech became a cohesive unit, resulting in a fine production. How do you get there? How do you take the known challenges, combined with many unforeseen factors and reach the end result? Vision. You have to have vision and trust and belief in yourself to make it a reality. The trust and support of those around you are crucial as well. When it’s not there, it doesn’t mean you can’t fulfill your vision –but it’s definitely easier when you have it. Ragtime was our choir director’s bucket list show. She spent years building enough interest in our small African American population at school to bring it to fruition. BHS has an African American population of less than 120 students and she was somehow able to get 30 to participate. It was no small feat. For those not familiar with the show, Ragtime must have three equally-sized groups to stage the opening number: New Rochelle (white, upper-middle class), African American, and Immigrants. There are individual stories that come from within those three groups that build the overall framework for the musical. The cast of Bartlett High School’s production of the musical Ragtime. In spite of all its challenges, the success of the production laid in the hands of the directors, volunteers and support staff that so willingly gave countless hours of dedicated labor to make it all happen. Without all the wonderful support, I’m not sure how I could have successfully survived my double duty as stage director and tech director. 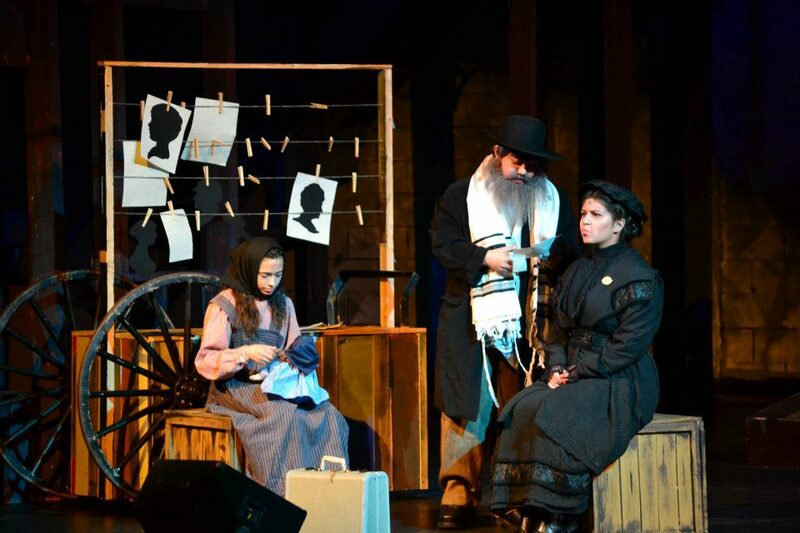 Little Girl, Tateh and Emma Goldman in a scene from Ragtime. In visualizing our production, I had to take into account the large size of the cast (116), the layout of the stage and how best to use it to tell the story and elements that would make our production unique. After spending many hours with the script and score, I returned to E. L. Doctorow’s novel for guidance to connect the dots. When it came to staging the show, I added in bits of business that reflected on the novel but were not present in the musical script. For instance, in the novel, Evelyn Nesbit was obsessed with Tateh’s Little Girl and she returned time and time again to have silhouettes done. In the musical there is no interaction between them at all. So in a scene where Tateh was working and confronted by Emma Goldman, I had him producing a silhouette of Evelyn and had her sneak out when they were distracted to avoid having her identity discovered by Goldman. In another instance towards the end of the show, when Mother finds out Father is returning to New York, I had Tateh and Little Girl enter with her and Little Boy to establish their growing relationship. Again, reflecting on the text of the novel. 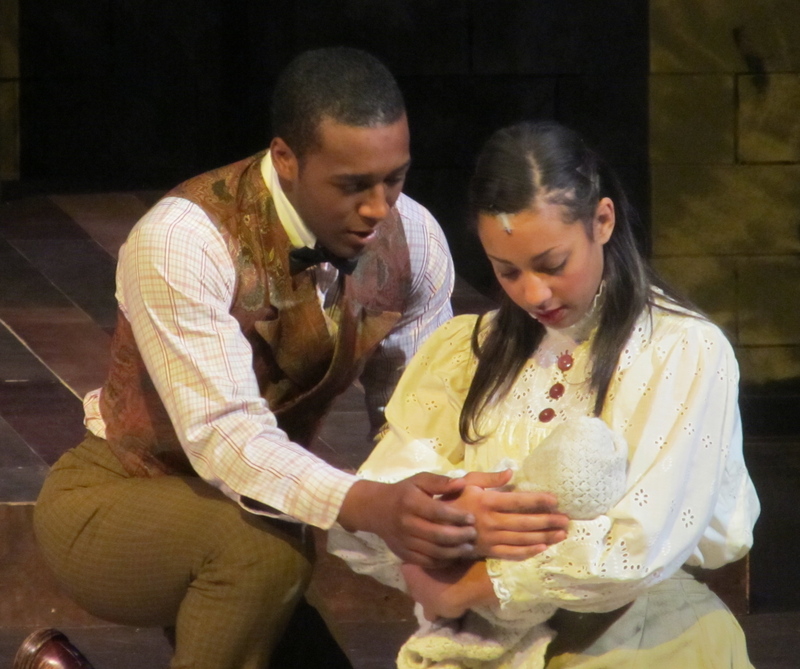 Houdini and Evelyn, “Atlantic City” from the musical RAGTIME. One of my favorite staged moments in the show was Houdini and Evelyn Nesbit’s Atlantic City routine. Instead of separating the two as it appears to have been written, our choreographer and I made them a team and created a beautifully executed vaudeville number. In the Henry Ford number, as opposed to having Coalhouse’s car simply driven onstage at the end, I envisioned a giant ‘puzzle car’ being assembled on stage with the pieces being held by the workers in the scene. At one point, I was afraid we weren’t going to be able to make it work but it came together quite well. 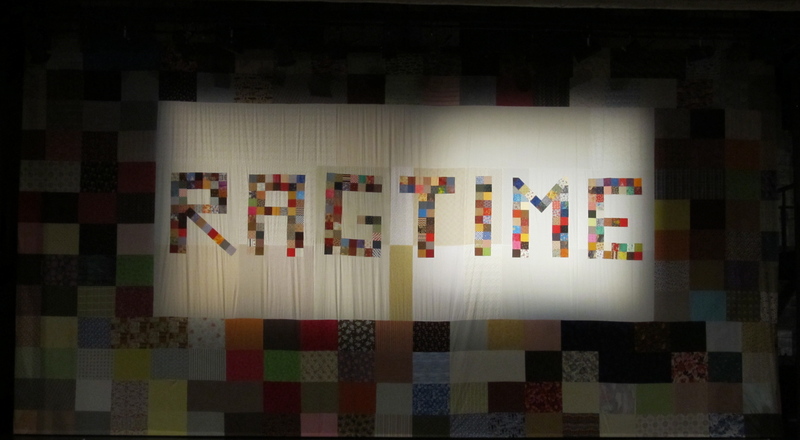 From the outset, I pictured an Act Curtain (Show Drop) that was a giant quilt with RAGTIME in large letters. I thought I might have to build it myself, but we were fortunate to find a wonderful woman that, after some begging and pleading, was convinced to create the 20 foot by 36 foot finished product… and it only took her five days! I wanted the quilt because it represented the piecing, or coming together of smaller units to create a whole, much like the melting pot of people that represent America. Wheels of a Dream from RAGTIME the Musical. There were many challenges associated with the production, as there are with most productions. One challenge was getting the cast to understand the historical significance of the material with an even bigger challenge being the way the show is written. Ragtime has many small vignette scenes that intertwine making it difficult for the young actors to develop and understand their characters. A lot of time had to be spent filling in the blanks– another way the novel was helpful. The biggest challenge was the size of the cast. Normally a high school production has somewhere between 40 and 60 performers but in recent years, BHS has cast 100 to a record 150 performers in last year’s Hairspray. This year’s cast featured 116 performers and along with the size of the cast came the issues of synchronization, rehearsal attendance and eligibility. Most of our leads were active in other school activities such as sports, clubs and competitive academic teams, requiring many changes to the schedule to accommodate productive rehearsals. Combine that with the added expenses of a large cast and a very tight budget and it is a wonder we were able to do what we did. 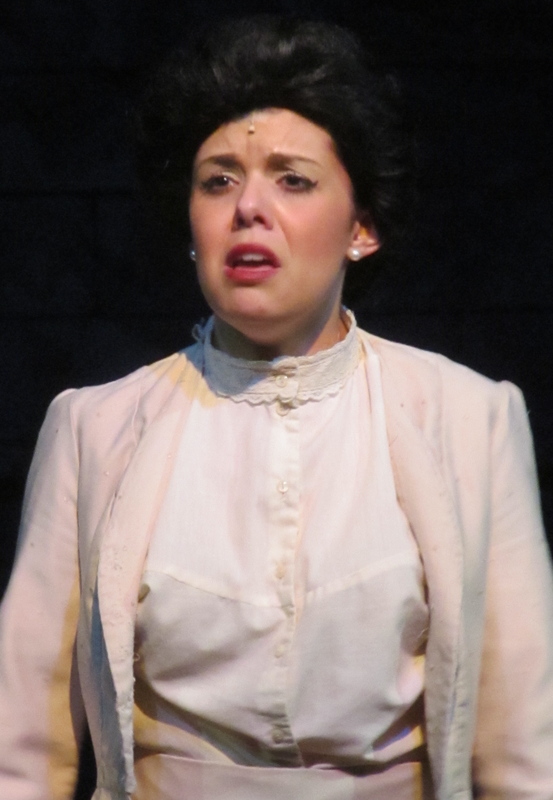 Mary DeWitt as Mother singing Back to Before in RAGTIME. I have to say there were a number of times I wanted to throw up my hands and give up on certain aspects of the production. Exhaustion and frustration begin to cloud your vision and make you question your original goals. About a week before the show, after a series of frustrating rehearsals, the choir director and choreographer approached me with solemn looks on their faces. I said, “Oh no, now what?” And they simply told me, “Don’t let go of your vision.” I hadn’t, and I didn’t– but a partly due to their never-ending support for my vision. You have to visualize and set your goals. You have to believe in your vision. Even though it may be a rough road with lots of bumps and curves, you can make it a reality. You must have faith… trust… and believe in yourself and the abilities of the others around you in order to succeed. 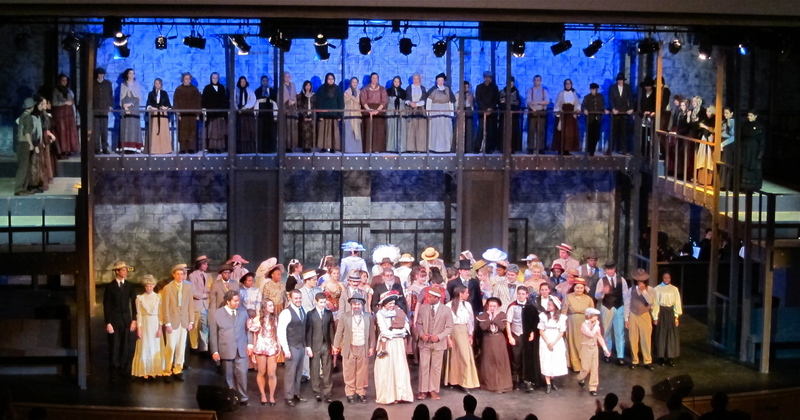 Closing Night Curtain Call of Bartlett High School’s production of RAGTIME. Thursday was a huge day for us, to say the least. It’s hard to believe how fast the week has gone and I can’t say I was looking forward to returning home. The South Tower Pool at the 9/11 Memorial. I’d gotten our passes for the 9/11 Memorial prior to our trip and we were the first group of the day. You have to go through all the same security procedures as you do when you fly, so the process takes a little while and you can not enter the site without passes. Having had my play, September’s Heroes produced by Bartlett High School last Fall, this visit held a special importance to me. I will be forever emotionally tied to the tragic events of more than ten years ago and needed to pay my respects and hoped it would help my ongoing grieving process. Currently the memorial is surrounded by construction on all sides. 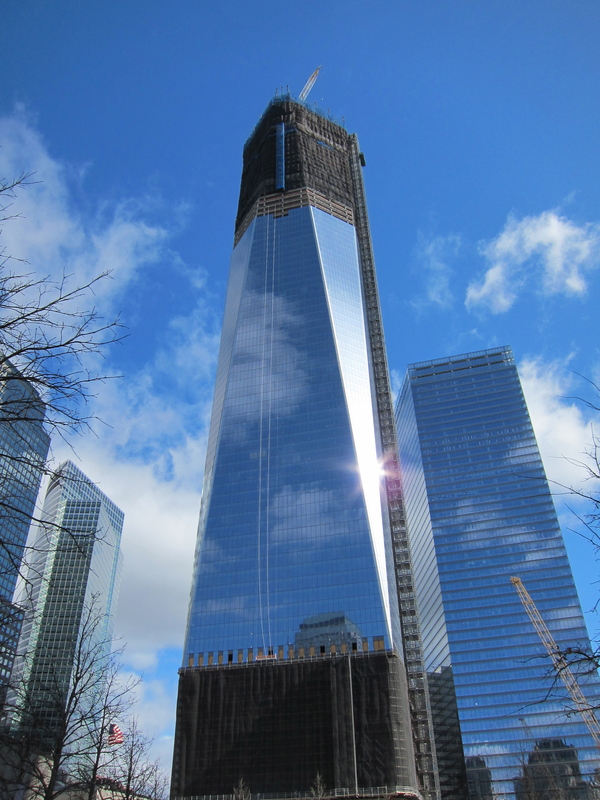 The new World Trade Center is quickly climbing into the sky adjoining the memorial and the 9/11 Museum which is set to open later this year. Right now, you can visit the two mammoth pools that mark the footprint of the original North and South Towers of the original World Trade Center. Surrounding both pools are all the names of those that lost their lives in the 9/11 attacks, including those at the Pentagon and in Pennsylvania. 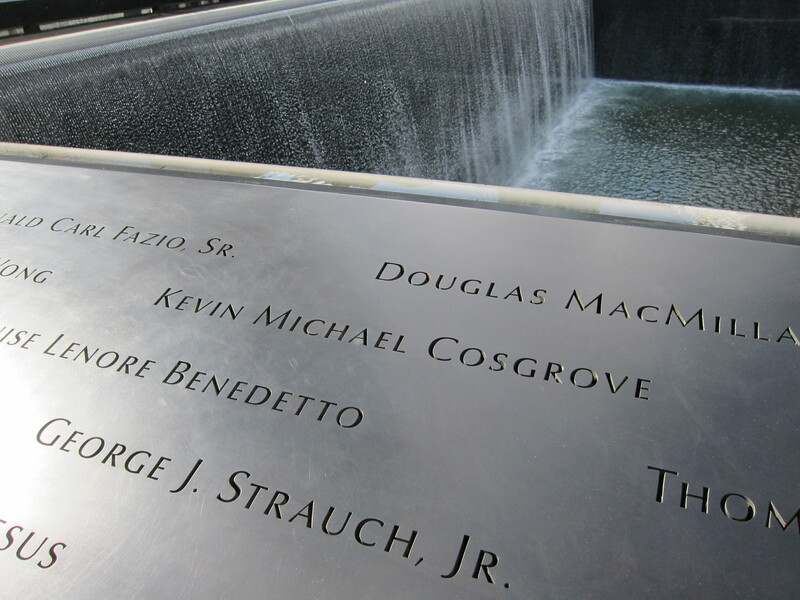 Kevin Cosgrove perished in the South Tower of the World Trade Center. 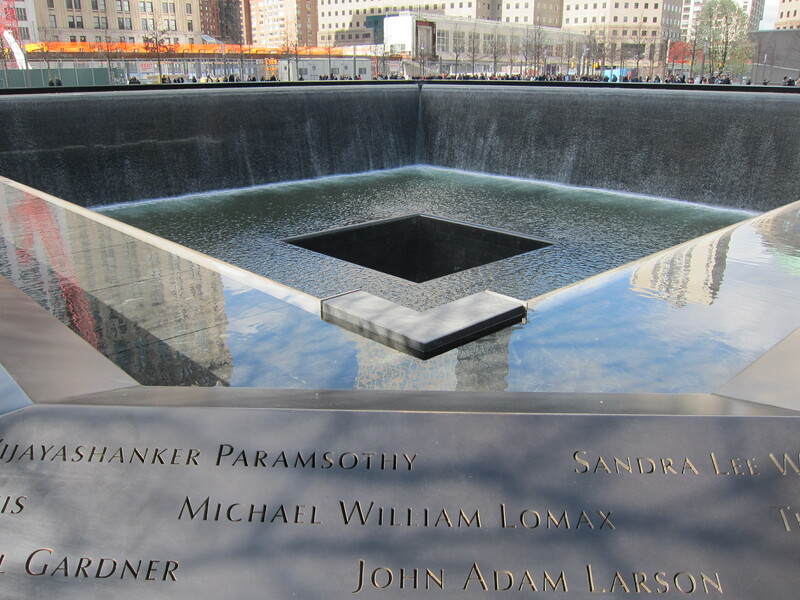 The moment that hit me hardest was finding the name of Kevin Cosgrove, who’s devastatingly powerful 911 call from the South Tower, up to the moment it fell, was the inspiration behind one of the segments of my play. Seeing his name brought back all the memories. I walked around both pools, trying to read all the names, never wanting to forget that moment. It will always be a part of me. When we left the memorial, we headed down to Battery Park and decided to take the ferry to Ellis Island. I hadn’t realized that Michael had never been to the park. The damaged Sphere from the World Trade Center Plaza is displayed there and you have a great view of New York Harbor and the Statue of Liberty. We got tickets and went through security (again) and boarded the ferry. The Statue of Liberty is closed for renovations at the base level, so we opted to stay on the boat (you can still walk around Liberty Island) and just go to Ellis Island. 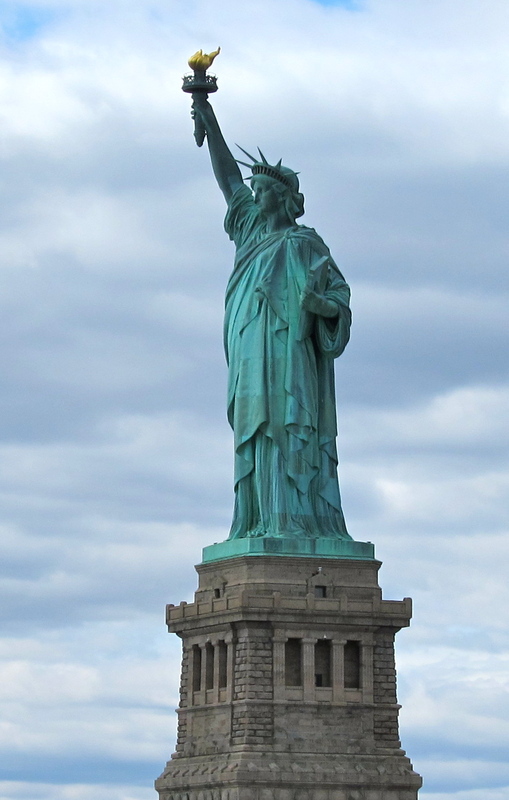 I’d been to the statue before, walked up to the crown, in fact, but in all my trips to New York, I’d never visited Ellis Island. I believe most of the buildings surrounding the main building are being renovated. The main building houses Registry Hall where new immigrants to America waited for processing. 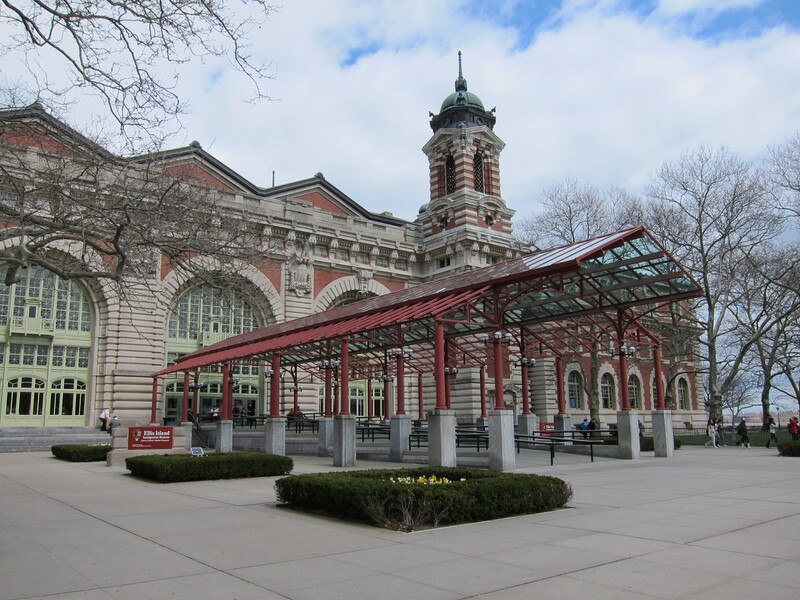 There are a lot of exhibits in rooms surrounding the great hall, full of pictures and information about the many years when Ellis Island was a working, entry point into the United States. As far as I’ve been able to research over the years, none of my ancestors came through here. There are many ways you can search, by computer or with assistance (and an appointment) for records of those that arrived. One of the reasons I chose to visit on this trip, is my work on the production of RAGTIME at school. I hoped visiting would give me some additional knowledge I could bring back to the students of Bartlett High. There is a scene in the show that depicts the immigrants arrival and I found a lot of good information about how the immigrants lived once they had been processed and struggled to survive in their new world. A funny side note– while we were waiting for the ferry back to Manhattan, one of our New York friends sent Michael a text asking him if we were ready to slit our wrist yet… knowing we’d seen two heavy plays the day before, and then visiting the 9/11 Memorial and Ellis Island (maybe you had to be there). We had enough time to stop at our hotel and freshen up before our final show, number twelve… the Broadway revival of Jesus Christ Superstar. This was not a good choice to end our trip. The best way I can describe the show is a huge mish-mash of costumes, time periods and effects… or a big conglomerate mess. From hip hop and Glee to time lords (or Star Wars) and leather…. it didn’t appear anyone could make up their minds what to do with this production. I felt that with all the technology they were using, this was the worst lighting of any show we’d seen. They didn’t even use their CNN-style scrolling ticker effectively. Just a mess. I won’t even get in to the casting or the switching of who sings what… Just an emotionless mess. 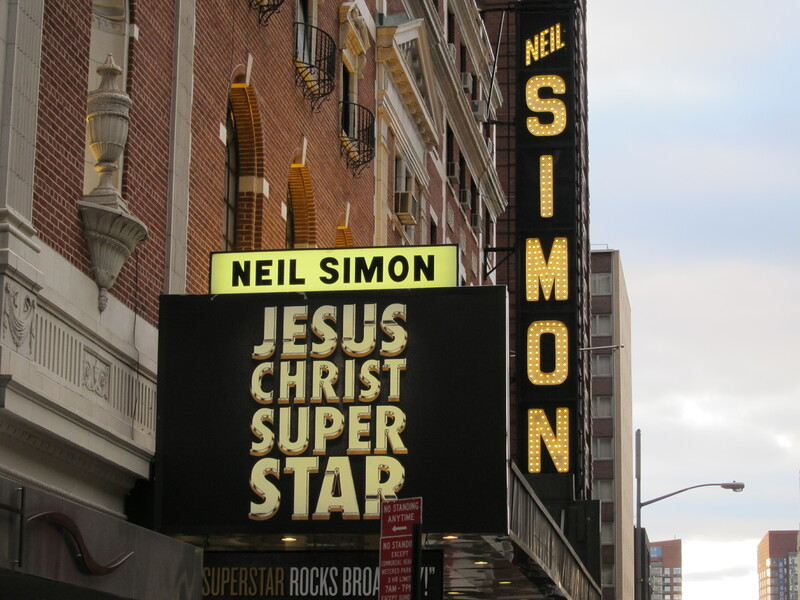 I’d wished we’d seen Godspell instead. As is our tradition, we stopped on the way back to the hotel and picked up a pizza from Famous Famiglia in Times Square and called it a night. The new World Trade Center under construction. The weather has been all over the place since we got here. Temperatures as high as 80 degrees and down to the low 30’s. Rain predicted for Wednesday came and went… several times but missed us for the most part. Overall, I really can’t complain. We were finally able to have lunch at Havana Central. We tried on Sunday but they didn’t open early enough to accommodate our show schedule. Just off of Times Square, they have a delicious array of authentic Cuban food and I was anxious for a return visit. Last time we were there I had some delicious pulled pork, yellow rice and black beans on the side. Cuban sandwiches are one of my favorite meals and I make my own version of them frequently at home. Michael and I both decided to try them here and they were quite good. BUT– if you want the best of all Cuban sandwiches, you have to try Silver Ring in Florida. They have several locations but the original in Ybor City closed a few years ago due to the bad economy. Luckily, there is a location in Lakeland, Florida near my parents home and we go nearly every time we visit. 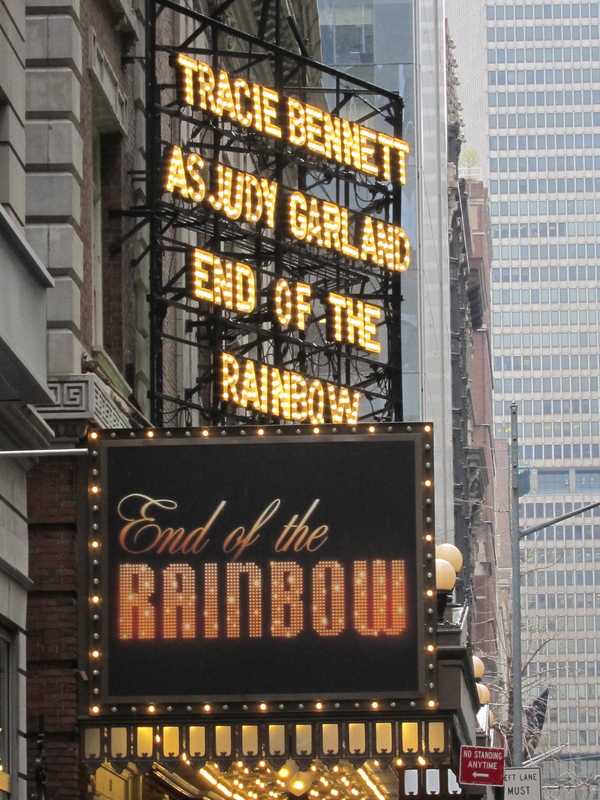 After lunch we headed over to the theater for the matinee performance of End of the Rainbow, which is set six months prior to Judy Garland’s death during her final comeback attempt at the Talk of the Town in London. The play with music, bounces back and forth between Garland’s hotel suite and her stage concerts. It is a moving account of some of Garland’s last days and Tracy Bennett is sure to be nominated, if not win, the Tony Award this year for her portrayal. What the film industry did to her, fueling a lifelong drug addiction is a travesty. We were able to meet up with our friends (and soon to be married couple) Carrie and Joel for a light dinner after a short walk through Central Park. The timing worked out perfectly. They were on their way to midtown for ballroom dance class (in preparation for the wedding) and we were on our way up to Lincoln Center. I really wish we got to see them more often. Seeing Carrie twice on this trip was a special treat. I was really looking forward to the stage production of War Horse. I saw the movie in December and cried like a baby through the whole thing. The stage version is an astonishing masterpiece. The brilliant ingenuity that went into the creation of the horse ‘puppets’ is a sight to behold. The two full grown horses require three operators, two inside and one to operate its head. The young Joey also required three human manipulators to enable Joey to run, move his ears, and make all the sounds you would expect to hear from a live horse. The production (as well as the movie) is based on a novel which I waited to start reading until after seeing both adaptations. All three tell the story in a uniquely different fashion and all three are moving accounts of a tragic time during the first world war. Michael and I both thought it was one of the best shows we’ve seen. After the show we headed back to Times Square and Michael suggested we eat at the infamous Tad’s for old times sake. There’s a back story here: Back in the late 80’s when I first started going to New York by myself, Tad’s was one of my favorite places to eat. Not, by any means, for the the ambiance. For only $6.99 you could get a ribeye steak, baked potato, salad and drink…. if you didn’t mind sharing a dining room with the homeless of New York. There is no wait staff, you order your meal and carry it on a tray and find a seat. 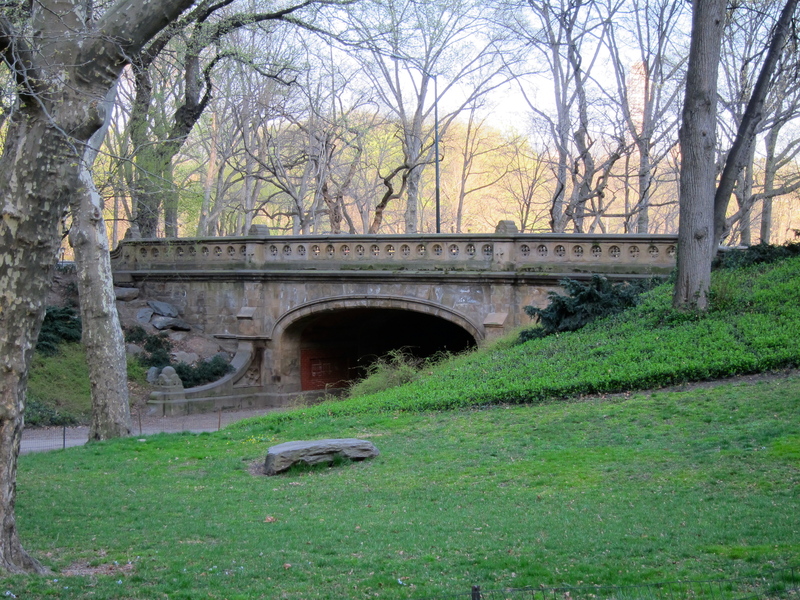 A view in Central Park. When Michael and I started going to New York together in the mid-90’s, I told him we had to eat there. By that time, prices had gone up to around $10.99 for the same meal, which all things considered, is still a bargain in New York –and it’s actually quite good. So, there we were, all these years later– back at Tad’s to relive the experience. I can’t say they’ve remodeled or even cleaned since we were there last… and the prices have skyrocketed to over $20 with your drink. To live life to its fullest, you have to experience the good with the bad, right?